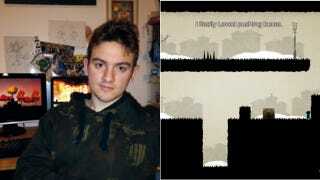 Eighteen-Year-Old Developer: "F**K F**K F**K THEY CLONED MY GAME"
Mattia Traverso's eighteen years old. But that didn't stop him from having his first-ever video game be about love. One and One Story's a puzzle platformer where the narration changes depending on what you do. Millions of other people tried out it as a Flash game and gave it love right back. Someone out there loved Traverso's game in the wrong way, though, and ripped it off wholesale and putting it on Apple's App Store as their own work. The fake One and One Story appeared two days ago, just a week after the Independent Games Festival where One and One was nominated as one of the best student games of the year. Traverso says he found out about the impostor earlier today via a Google Alert. "I couldn't believe it," he said over Skype text chat. "I thought it was a joke." Traverso think that the ersatz One and One's the work of a Vietnamese developer who's touting the release on a Facebook page. "The original version was made in Flash, which is fairly easy to decompile," he explains. "They just took the old .swf, took the graphics and probably rewrote the code." Cloning's becoming an increasingly troubling issue in the game development community. Recent examples include the high-profile bogus Pokemon Yellow app, the Radical Fishing the Tiny Tower/Dream Heights brouhaha between Zynga and NimbleBit and a similar indie scandal over Ridiculous Fishing and its clone Ninja Fishing. particularly amongst indie game-makers who don't have the legal or logistical resources to protect their work. Worse for Traverso is the fact that he and his team have been planning their own port to iOS. "We started working on it two months ago and are in the beta stage. We're doing a redesign to make it work better for the iPad," he says. When I asked him is he's able to take anything away from this occurrence, Traverso says an iOS release closer to the flash version would probably have secured his position in the App Store better. "I waited a lot of time to start working on this and I was sure nobody would have copied the game." One and One Story won accolades from other game creators and Traverso says that other indie devs have rallied to his cause. Canabalt creator Adam Saltsman has helped him file a DMCA complaint with Apple to have the impostor game taken down. Still, Traverso remains stunned. "I know it's stupid, but I didn't think there was a chance of a human being just taking it and putting it on the App Store." Unfortunately for him and other independent game designers, the cloning and theft of popular games is a shadowy enterprise that's all too easy to pull off. Kotaku's reached out to Apple for comment on this story and will update it if neccessary.